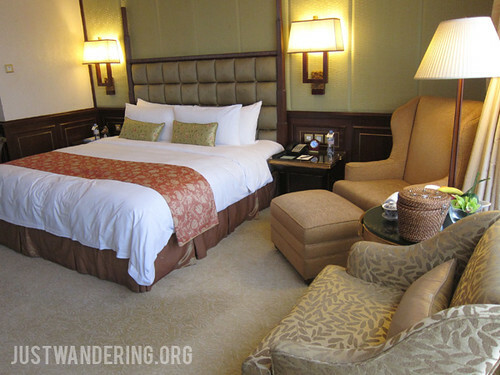 I know about the Horizon Club — this is Shangri-La’s premier rooms class, wherein guests enjoy exclusive perks and personalized service. Think of it as the business or first class service offered by airlines, except in a luxury hotel context. I didn’t receive any detail about my stay, except for the days that I will be staying, and my request for a harbour view room, so this was a delightful surprise. At the top-most floor of the hotel sits the Horizon Club Lounge, where Horizon Club guests can check in, enjoy complimentary snacks and beverages all day, and hold meetings. The decor was very elegant, the room lit by shimmering crystal chandeliers at night and natural light from the windows during the day. The walls have glossy dark wood panels, and there are more than enough plush seating for groups of any size. It was over the top, yet it wasn’t gaudy. They are crazy about chandeliers here! Though I arrived early, my room was ready and I was personally escorted by Peggy, the Horizon Club staff who checked me in. As we walked, she told me about the hotel’s facilities, and when we got in the room, she explained the room’s features and assured me that if there’s anything I need, I can give them a call. Super comfy bed, and I love that the controls for the lights, as well as the curtains are within reach. As soon as she left, I stared spazzing out about my room. It was beautiful, as expected, but it still went beyond what I was expecting. I’ve stayed in a fair amount of hotels, and after a while, they all start to look the same. Of course, it’s not exactly the same, but it has a generic feel to it. Shangri-La hotels have always injected a local aspect to in the designs of their hotels, so that’s one way each hotel differ from each other. 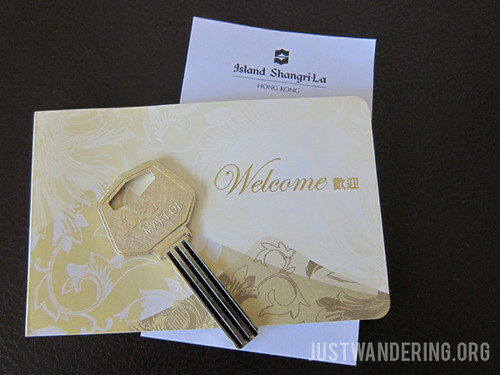 Island Shangri-La incorporates a mix of Chinese and European design and the result was simply amazing. Though the design of the room isn’t where my preferences lie, I have to admit that it was beautiful. Kinda old school, but I love it! 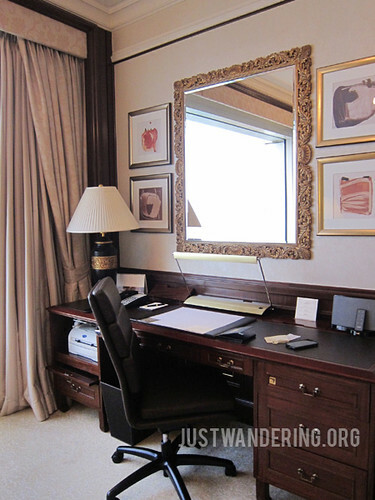 Of course, adding to the room’s charm were the amenities and touches that go beyond the usual. There was the personalized message from the General Manager on the TV, the chocolate pralines that come with the complimentary fruits, the brobdingnagian desk that has more than enough space for my mess and has office supplies that any executive might need, including a fax machine. Calm before the storm: the desk before I started working. In the bathroom I was met with not one, but two porcelain fixtures: a toilet and a bidet. I have gotten so used to seeing the handheld or the attached bidet, so seeing an actual bidet was a surprise, and admittedly, a cause for a piqued curiosity. 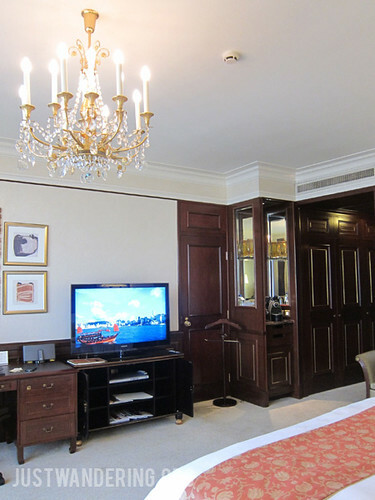 On the opposite side lies the bathtub, but what really draws the eyes is the small TV perched on the wall. I love soaking in the tub, but I quickly get bored since there’s nothing to do and I’m too paranoid to fall asleep while inside, so this is a lovely, and much welcomed feature. What’s not evident at first glance was that the tub was a bit bigger than the standard sized tubs, and that it has a temperature controlled faucet. No more guessing if your water’s too hot or not hot enough! Hot towels, fruits, chocolates, hot tea, and a gorgeous view. I couldn’t ask for more. Just as I was coming down from my initial high from seeing my room and exclaiming over its features, there was a knock on my door (rather, a buzz from my room’s doorbell). 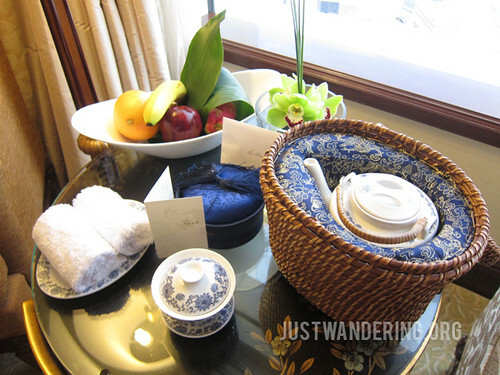 It was Betty, the housekeeping staff servicing our floor, bringing in a fresh pot of jasmine tea. 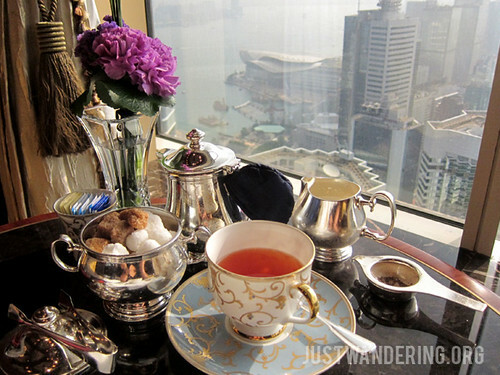 Drinking and offering tea is a big part of the Chinese culture, and thus, it is part of the Shangri-La experience in Hong Kong. The teapot comes in this padded basket that keeps the tea warm, and there’s certainly enough to last you for a good part of the day. Horizon Club guests also get served tea or coffee if they request for a wake-up call. 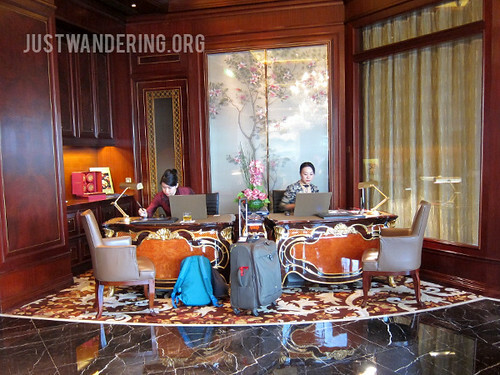 They can also make their own using the coffee and tea making facilities in the room, or at the Horizon Club Lounge. 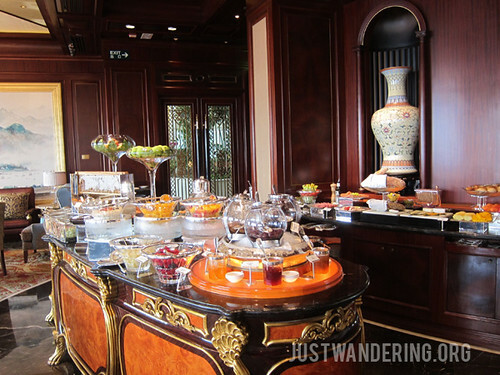 They also have the option to have breakfast at the lounge, or at the Restaurant Petrus next door. While the option to have a buffet breakfast at Café Too is available, those seeking to have a quiet and leisurely meal will definitely appreciate eating at the 56th floor. When I came up to the lounge on my second day, I was welcomed by name and led to a table facing the harbour. I presented with a menu for Restaurant Petrus. Though I am dining in the lounge, I can order up to two hot breakfast from the restaurant. While waiting for my order, I started on the continental breakfast available at the lounge. I asked for tea and this is what I got. Fancy! It was a small selection of what is served at the buffet 49 floors below, but it has the basics: congee, cereals, breads, fruits. However, all was forgotten when I caught sight of some fresh ripe mangoes, and when I got my eggs benedict from Restuarant Petrus. The lack of crowds was certainly a huge plus in the Club Lounge’s favor, as well as the service from the staff. They were attentive, but not intrusive. I made two more trips to the lounge that day. Since I didn’t get enough sleep to catch my early morning flight and spent the entire day outside during my first day, I spent my second day just staying in the hotel, catching up on work. I signed up for an online course, and it just so happened that it started that same week. In hindsight, I was glad for that, as it took me less time to finish the first module, thanks to Shangri-La’s fast Internet connection. Whenever I start getting restless or needed a break from the online course, writing, and coding, I only had to go down to the pool for a quick dip, up to the lounge for some snacks, or just look out the window and watch the boats going up and down the Victoria Harbour. Island Shangri-La houses eight restaurants, including the two Michelin starred Summer Palace, where I met up with Reena Tee, a Communication Executive for the hotel, and a fellow Filipina. 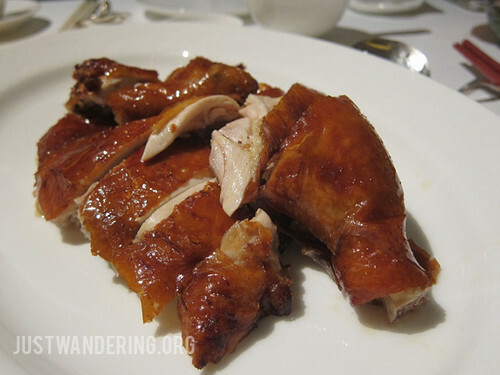 We talked about the hotel, compared notes about living in Hong Kong and the Philippines, and shared a an appreciation for the amazing dishes we had for lunch. We had baked pork buns, something that I have been craving for since 2010, followed by succulent suckling pig, with meat so tasty and skin so crispy. I was already happy with those, but the other dishes we had, the wonton in young coconut, the king prawn with truffle, the crispy chicken, and the mango sago made it all the more amazing. 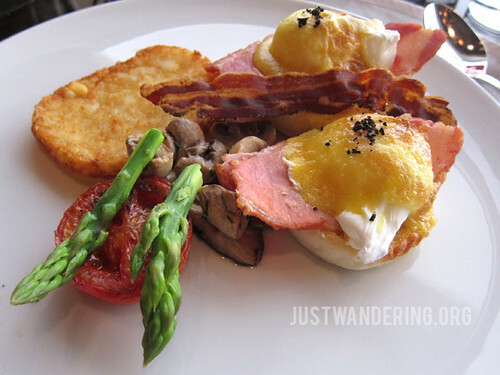 Restaurant Petrus’ eggs benedict. YUM. I capped my stay with breakfast at Restaurant Petrus. 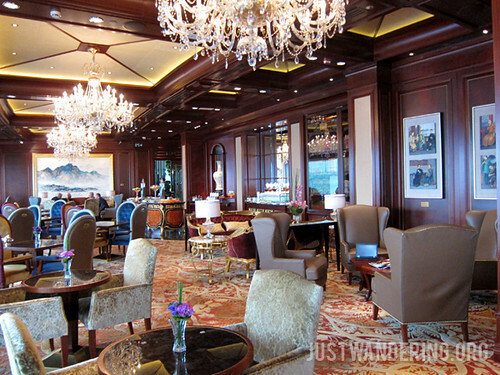 Unlike the Horizon Club Lounge, which is exclusive to the guests, the French restaurant is open to all. There were as expected, more diners, but still not too many to be crowded. As I dug into my soft scrambled eggs with lobster, I thought back to the past couple of days. While the amenities and the facilities of the hotel go beyond what I was expecting, it is the people that really stood out for me. From the warm smiles and personal greetings I got from Jacqueline and Frank every time I go to the 56th floor, Peggy walking with me all the way to the elevator to go to Pacific Place, chatting and pulling on my heavy luggage, to the unseen crew who change the carpet in the elevators daily to reflect the day of the week, they were the ones who made the stay unforgettable. That is the true Shangri-La experience. Once again, much thanks go out to Shangri-La for this amazing opportunity. 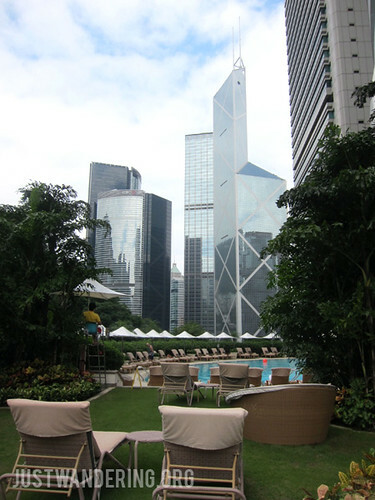 Want to see all my photos at Island Shangri-La, Hong Kong? View the album on the Just Wandering Facebook page. GUSTO KO NG BIDET! It’s one of the best toilet inventions ever. Wala na kme nun dito sa Amerika Buti pa sa Dubai at kahit public toilet sa gasolinahan sa gitna ng kawalan ay merong bidet. Hahaha bidet talaga napansin! Ayan din na miss ko when I go out of Asia! It’s good to read about your personal taste vis a vis the decor, and that it was the people there who made the experience special. I find that with any travel, it’s almost always the people that makes or breaks the trip. Thanks for dropping by!